Back in February, I got a text from my friend and editor/writer Ben Duchesney (formerly of Kayak Angler Magazine) inviting me on a canoe trip in the Adirondacks. Unfortunately, I had other obligations and, after some thought, I had to say no, but I figured that he and the rest of the crew would have a blast, as the Moose River and surrounding area is full of fish. I joked a bit about southerners planning a trip in upstate NY in April, and we had some friendly back-and-forth banter in the weeks prior to his journey. Somewhat regrettably, I deleted that text conversation a few months ago to make room on my phone. In hindsight, I would love to read it again, as saying yes would have been a heck of a different outcome for me. Ben and the rest of the group (Robert Field, Rex Del Rey, and Mark Vlaskamp) ended up on a grueling week long adventure that changed their lives forever. Below is the first video in the four part series. The others can be found at YakfishTV or on YouTube. Check them out if you get a chance! Being a huge fan of fishing I literally enjoyed every bit of your fishing video. 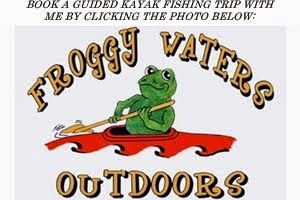 I really wish to join you in your this adventurous fishing tour.